(Nanowerk News) Scientists in Australia are reporting the first use of ordinary cotton thread and sewing needles to literally stitch together a microfluidic analytical device — microscopic technology that can transport fluids for medical tests and other purposes in a lab-on-a-chip. The chips shrink room-sized diagnostic testing equipment down to the size of a postage stamp, and promise revolutionary applications in medicine, environmental sensing, and other areas. Their study is in ACS Applied Materials & Interfaces ("Thread as a Versatile Material for Low-Cost Microfluidic Diagnostics"). Wei Shen and colleagues note that the development of low-cost “lab-on-a-chip” diagnostic tests has become an attractive area of research. Existing devices require etching microscopic channels onto slivers of silicon, glass, ceramics, or metal in a costly, complicated process. 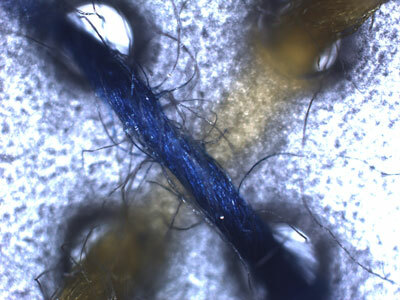 The scientists set out to find an alternative, and did so with cotton thread, which wicks fluids along its tiny fibers.